Adrian Valderrama, an 18-year-old high school senior from Dallas (who plans on attending the University of North Texas as music education major in the fall 2004), sent in this shot. 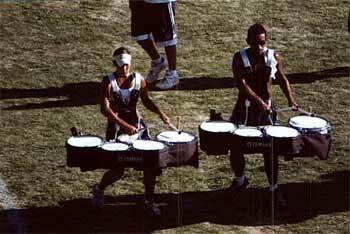 "2003 was my first summer marching in DCI and I spent it with Spirit's tenor line. This is a picture of me (on the left) and my "brother" Leo while we were rehearsing in Jacksonville, Ala., before Spirit's home show. Out of the four other guys on the line, Leo and I became like brother and sister over the summer. We even went through the "I-hate-you" phases, but I think that was the sun talking because it only lasted for a week. He aged out, but I will always miss playing next to Leo, the Venezuelan Sensation!" Thanks Adrian!